Background: Endometriosis is a disease that is hard to diagnose without the gold standard method, laparoscopy. An easier diagnostic method is needed. Objective: The aim of the study is to determine whether the number of macrophage cells in the endometrium and/or the detection of nerve fibers can be used in the diagnosis of endometriosis. 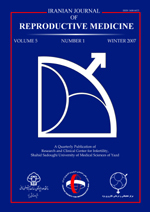 Materials and Methods: Endometrial sampling was done to 31 patients prior to laparoscopy (L/S) or laparotomy (L/T) at Istanbul University Istanbul School of Medicine Hospital between January 2010 February 2011. Also 34 patients who were retrospectively chosen from their files were added to the study. 5 patients were excluded from the study. Totally, 31 patients were placed in the endometriosis and 29 patients in the control group. Endometrial samples were evaluated immunohistochemically with the markers protein gene product 9.5 (PGP 9.5) and neurofilament (NF) for nerve fibers and CD68 for macrophages. Results: None of the samples were stained with PGP 9.5 and NF. As for CD68+cells, no statistically significant difference was observed between groups (endometriosis: 216.10±104.41; control: 175.93±43.05, p=0.06). Results were also evaluated in the subgroups of menstruel phases and disease stages. Only in the proliferative phase there was a significant increase in the endometriosis group (p=0.03). No significant difference was observed between the stages. Conclusion: The detection of nerve fibers in the eutopic endometrium with the markers of PGP 9.5 and NF is not found to be helpful in the diagnosis of endometriosis. Macrophage cells may be helpful in the diagnosis only in the proliferative phase.